North Bergen native Greg Herenda led his Fairleigh Dickinson University basketball team to the NCAA Tournament and a First Four win over Prairie View A&M to get a meeting with top-seeded Gonzaga in the next round of the tourney. The NCAA Tournament definitely had a local flavor this year. Jersey City native Bobby Hurley led Arizona State to its first tourney victory in 10 years, assisted by another Jersey City native in Rashon Burno. The University of Cincinnati’s assistant coach is another Jersey City guy in Darren Savino. In terms of players, three Hudson Catholic grads, Jahvon Quinerly (Villanova), Louis King (Oregon) and Luther Muhammad (Ohio State) all earned trips to the Dance. At Fairleigh Dickinson University, former St. Peter’s Prep and St. Anthony standout Kaleb Bishop has enjoyed a breakout season, becoming a starter and prolific scorer for the Knights. But there’s no better story than the one that involves Bishop’s coach, another Hudson County boy. Greg Herenda grew up in North Bergen and attended St. Peter’s Prep, graduating from Grand and Warren some 40 years ago this year. Herenda has paid his dues as a basketball lifer, spending decades as an assistant coach, with stops at places like Holy Cross, Yale, East Carolina and Seton Hall, with the hope of one day becoming a head coach. Herenda got that opportunity a decade ago, but had to travel to places like a junior college in Elgin, Illinois and a small Division III school called Cabrini College outside of Philadelphia to get his break at UMass-Lowell and finally, back in his home state with FDU six years ago. In 2016, Herenda guided the Knights back to the NCAA Tournament in an epic run in the Northeast Conference tournament that culminated in the chance to Dance. But this season, Herenda, just a year removed from a near-fatal bout with dangerous blood clots, knew he had the goods to make a return trip. 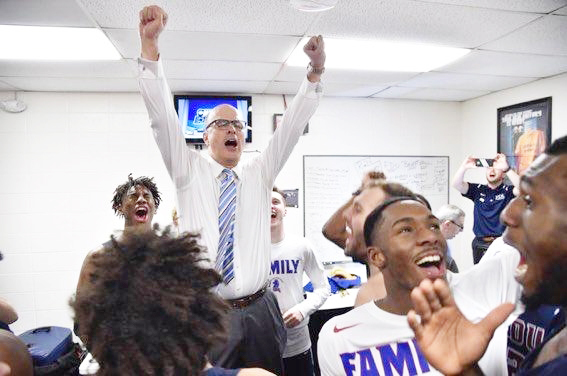 So then there was no surprise that the Knights won their first-ever NCAA Tournament game recently, having defeated Prairie View A&M in the First Four bracket in Dayton. One of those good players has been Bishop, who has developed into a premier outside threat and although only a junior, has worked diligently to become a professional basketball prospect down the road. Bishop isn’t exactly an NBA prospect, but he’s definitely improved enough to earn a paycheck somewhere playing the game he loves sometime after next season. Bishop averaged 10.1 points and 6.5 rebounds per game this season for the Knights, averaging more per game in college than he did in high school. Herenda also put his faith in a sophomore point guard from Ranson, West Virginia named Jahlil Jenkins. Jenkins has developed into the finest ball handler and distributor in the Northeast Conference. How this young man was not honored on an NEC postseason team is beyond comprehension, because he’s clearly the best point guard in the league. And then there are people like Darnell Edge, who merely had his career high against Prairie View, scoring 33 points. Imagine, a kid plays four years at FDU and he has his best game of his career in the NCAA Tournament. Mike Holloway, Jr. is another four-year player who experienced the NCAAs in 2016 and now has an NCAA Tourney victory to add to his resume before graduation. So the Knights went on the road to defeat St. Francis of Pa. to earn the right to get to Dayton. Then they defeated Prairie View in Dayton for the right to move on to Salt Lake City and face top-seeded Gonzaga, merely one of the nation’s best programs all year long. It’s the stuff that dreams are made of – and one that Herenda might not have seen if he didn’t survive the horrific two-week stint in a San Antonio hospital a year ago. Herenda was at the NCAA Final Four with his wonderful wife Jill and son Trey, when he fell ill with a fever of 104 and finally the diagnoses of blood clots in his legs. Herenda quickly points out that he has two people shining down on him – namely his mother, Grace, who died nine years ago, and his coach at Merrimack, Bert Hammel, who died last year. To read Jim Hague’s column on Coach Herenda’s journey back to health, here’s his column from August of 2018.